Tip - Two people are needed for this procedure, one to move the server in and out of the rack, and one to observe the cables and CMA. For a free-standing rack, deploy the antitilt bar. Unlock the slide lock buttons at the right and left sides of the chassis. Slowly pull the server out of the rack until the slide rails reach their stops. Inspect any attached cables for binding or kinks. 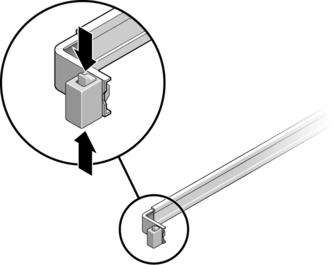 Verify that the CMA extends fully and does not bind in the slide rails. Verify that the server extends fully and locks in the maintenance position. The server should stop after approximately 15 in. (40 cm) of travel. Pull both slide rail release buttons toward you simultaneously and slide the server back into the rack. The server should slide smoothly into the rack without binding. Verify that the CMA retracted without binding. 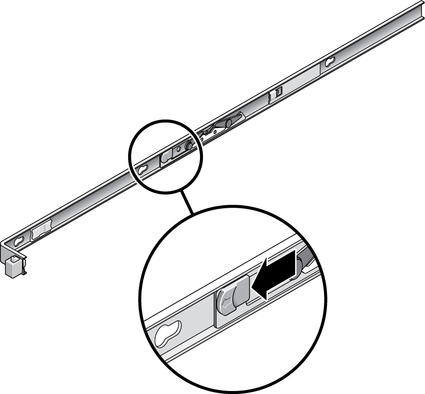 Adjust the cable straps and CMA as required to secure the cables. See Managing Cables With the CMA.